We’d been wanting to check out this rather remote and very rarely visited 12th century ruined temple site for a long time and so a free (and sunny) day after finishing a Highlights of Cambodia tour seemed like a good opportunity to have a go at reaching what are certainly some of Siem Reap’s least accessible ruins. 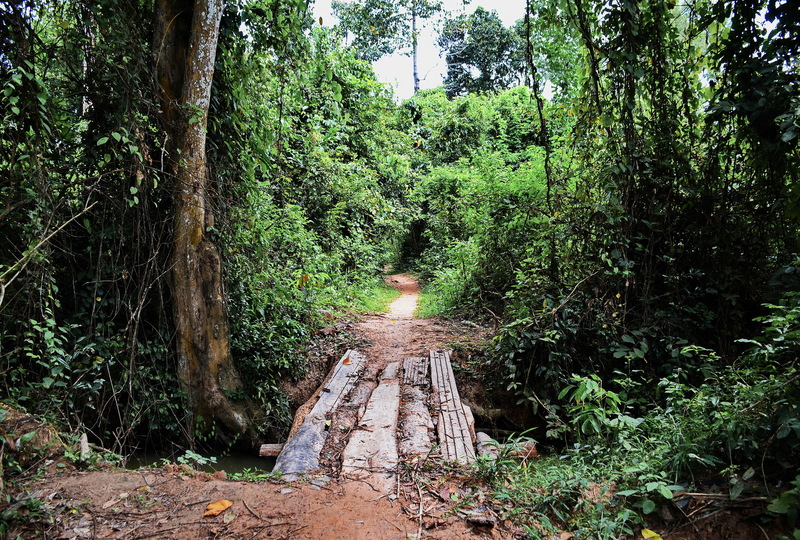 We say difficult to access though we did luckily come across a guide who’d once taken a tour group there from their 5-star lodgings for an off-the-beaten-track ‘jungle picnic’ so, assuming he’d be a good source of travel directions, we asked. “Helicopter”, he replied, “…no road”. We’d guessed the latter but Google maps did seem to show a track of sorts and reckoning in these parts there weren’t too many spots inaccessible to a trusty $10 a day Honda Dream rental bike we set off for what maps indicated to be the closest village to the ruins. From there we could, at worst, walk. Our target temple, Banteay Ampil, was originally constructed on the ancient Angkor period road linking the capital at Angkor to the important regional sites of Beng Melea and Preah Khan, Kompong Svay. 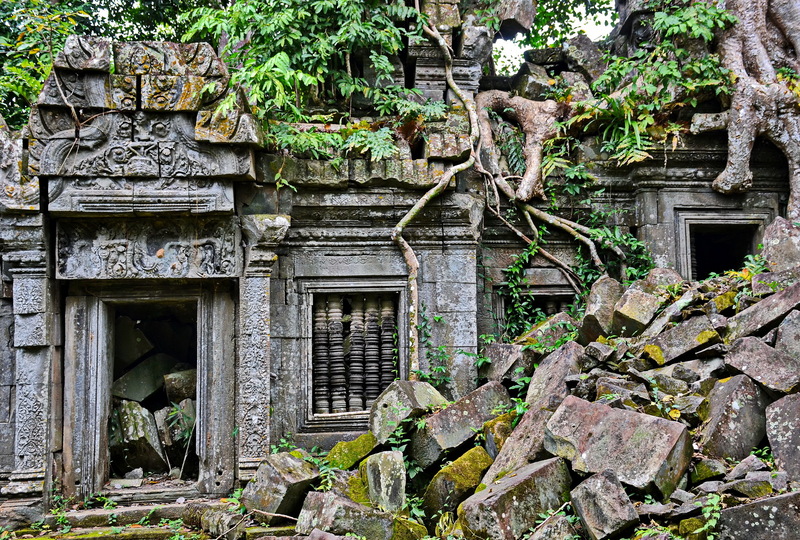 The temple is some 35 kilometres east of Siem Reap Town lying approximately halfway between the earlier and also remote temple of Chau Srei Vibol and the popular ruins of Beng Melea. 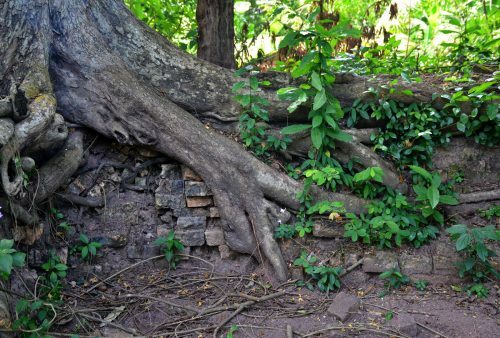 We optimistically began at the aforementioned Chau Srei Vibol Temple but the old Angkor period route was long overgrown and inaccessible so plan B took us to Samrong – according to maps the closest village to our destination. “Ah, over there, only 1 kilometre”, was the reply to our enquiry at the village grocers. 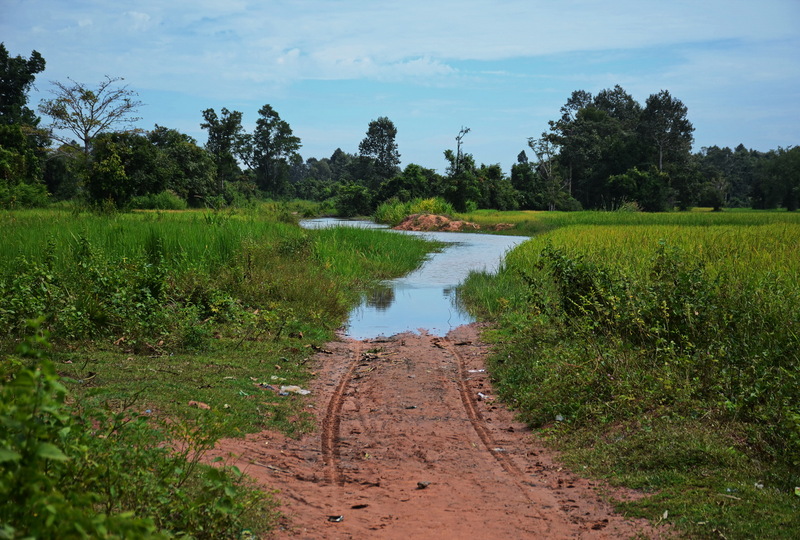 A lot of things in Cambodia are only ‘1 kilometre’ and they always seem to be ‘that way – straight on”. Needless to say, they very rarely are. We guessed the water-logged track leading due east was indeed the original road and a chunk of it may well be doable in the dry season but photo 1 was what we were presented with post-monsoon so from then on it was on foot. 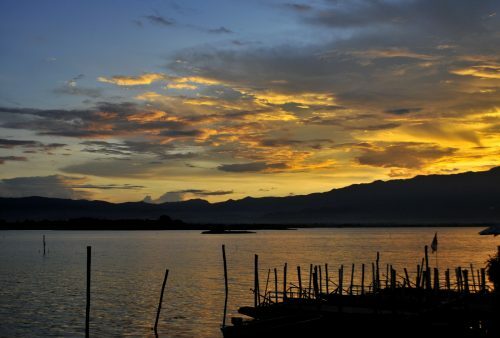 Apparently, if and when intrepid visitors do turn up, there’s a standard $10 guide fee for a villager to lead them to Banteay Ampil though luckily when we arrived the village school teacher – who happened to live out that way – was on her way home. 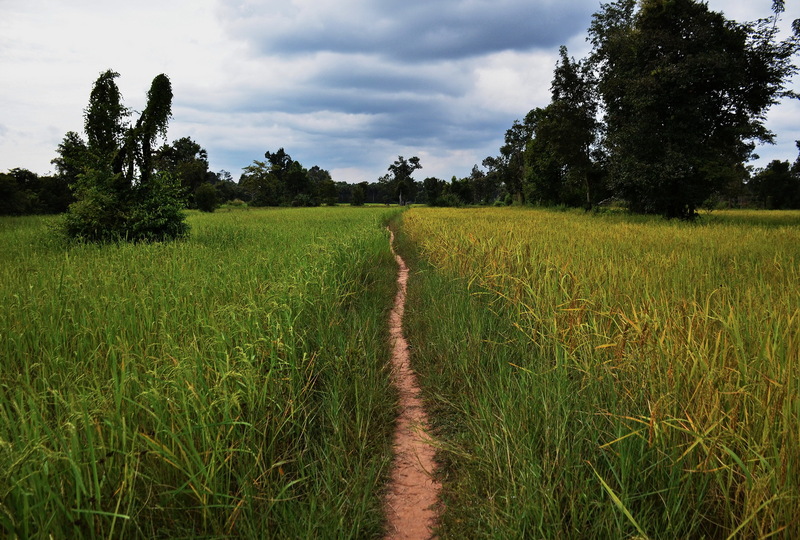 Fortunately, as the path was more like 3 than 1 kilometre and zigzagging through flooded paddy-fields and winding through dense woodland was nothing like straight. Still, anticipation spurred us on and even breaking into a trot for the final section – the remains of what looked like an ancient reservoir was a clue we were getting close – we eventually glimpsed an outer laterite wall through the foliage and emerged at the southwest corner of the temple complex. 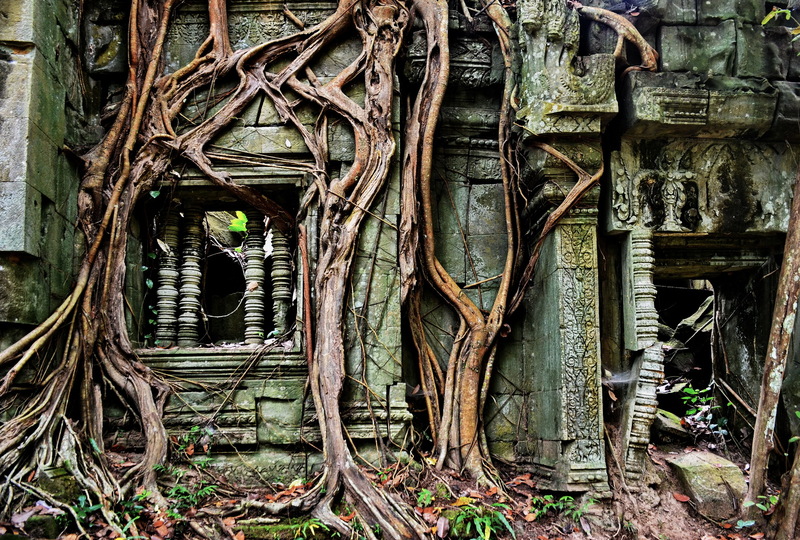 Although remote and very rarely visited some maintenance work had clearly been done on the temple of late and the exterior walls and interior courtyard had been cleared of jungle. After a ciggie break with 2 surprised temple guards we found asleep in hammocks we entered the temple itself by way of a gap in the south wall. The style seems classic early to mid-12th century so probably dates from the reign of Suryavarman II and is then roughly contemporary with nearby Beng Melea and of course Angkor Wat itself. Aside the outer laterite walls construction is in sandstone and the substantial ruins could be described as mid-sized in temple terms. 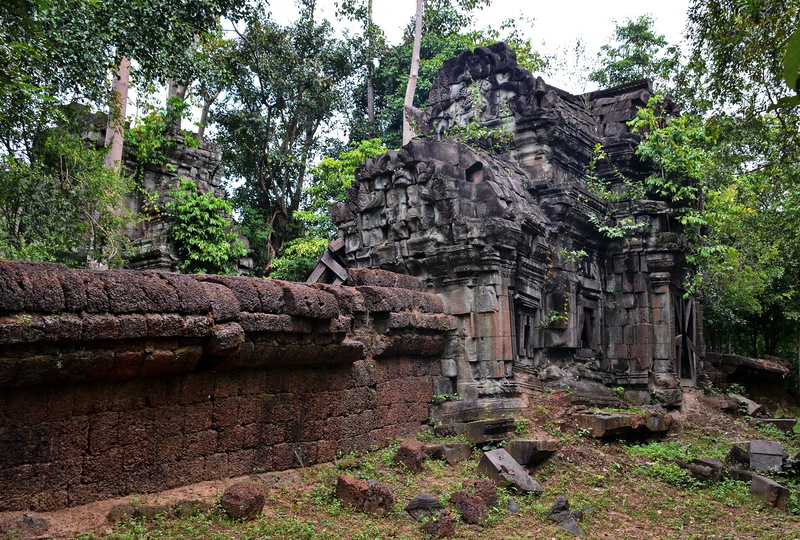 The layout is broadly similar to another nearby and similarly dated temple Banteay Samre with an elaborate, main gopura on the east side giving on to a series of chambers leading to a central tower. A pair of relatively well preserved ‘libraries’ lie on either side though it does lack the outer collonade of Banteay Samre. There’s an impressive southern entrance way – which would have given onto the adjacent road – while the western gate is minimal and a northern one completely lacking. Although all entrances are blocked by fallen masonry overall the temple is in relatively good condition though it does lack many impressive carvings. There was some evidence of looting but most of the lintels seemed to have suffered badly from natural erosion so it could be that poorer quality sandstone was employed here to the benefit of more important neighbouring sites such as Beng Melea. Dense forest surrounds the site on all sides so it’s impossible to see whatever entrance causeway could have existed. Nor could we see any immediate evidence of a moat though an overgrown but clearly right angle cornered pool a short distance to the west of the site did look suspiciously like the remains of a period reservoir. 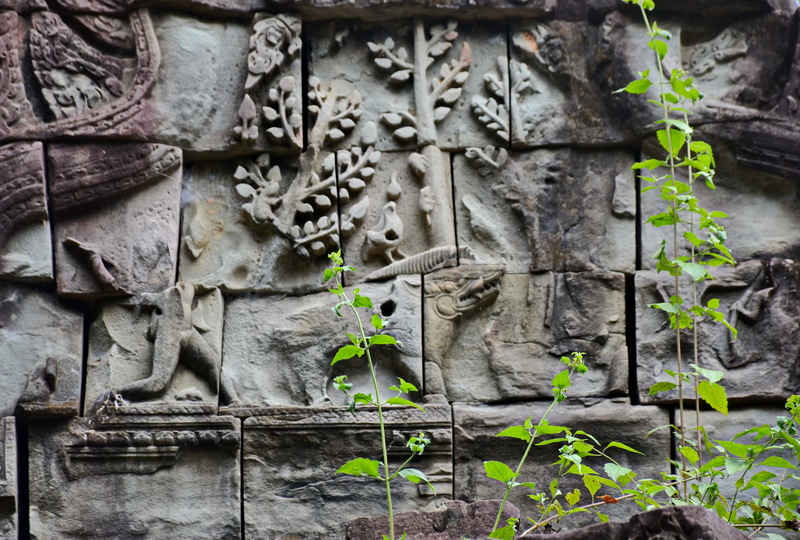 What Banteay Ampil lacks in fine carvings it makes up for in atmosphere and vines, creepers and fig tree roots replace period decoration though some details can be made out on some of the lesser eroded pediments and lintels. Below, sadly lacking his head, is the god Yama riding his buffalo while photo 7 illustrates the Arjunakirata story where Shiva and Arjun dispute whose arrow killed the fierce looking boar. 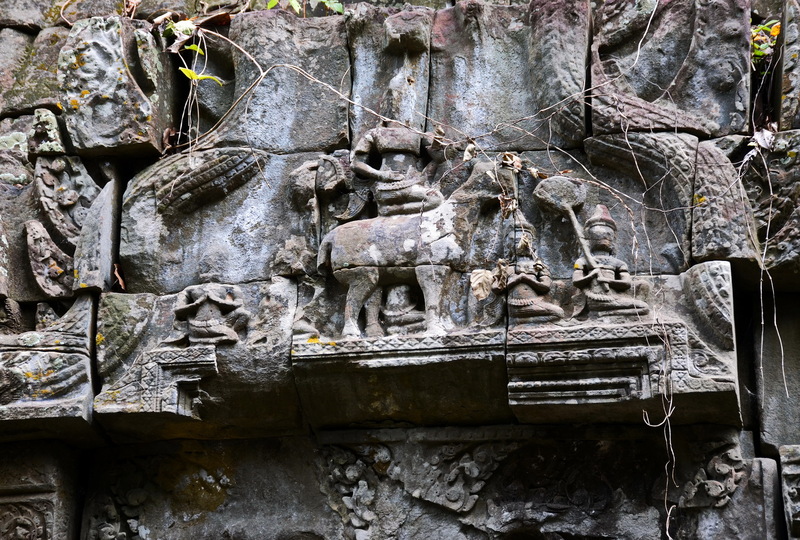 The boar and tree are well preserved although the figures completely eroded. Anyway fascinating spot and we’re planning a return dry season visit when vehicle access will be easier since we’re sure the area holds a few more secrets yet to be discovered. Our Banteay Ampil trip was on a free day during our Cambodia Overland tour and not part of any itinerary as such but anyone interested just give us a shout.